Karzon Hall: This building is generally known as Karzon Hall. It was established in the early 20th century by a british governer named Lord Karzon. 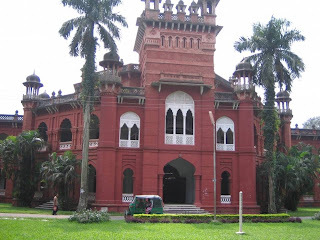 But In 1920 the University of Dhaka was established and since then Karzon hall is a part of the University of Dhaka.It is a three storied building with 32 lectures room and the hall room is used as an exam hall. Here about 700 students can participate exam at a time.It is a giant building. this building is architectarly very important and an centurian symbol of British adminstration.